Attended today the 6Th Edition Of ThinkEdu Conclave organised by the New Indian Express at Chennai. The Honorable Union Minister for Human Resource Development, Mr Javadekar addressed the audience and shared a very comprehensive plan for better education at all levels in the immediate future—A change from the current ‘Aanna Khannaa and Jannaa ‘ ( coming, eating and going)..
( Quality Education for All). I too was a panellist to speak at the Conclave. I wish to share what I said as this is relevant for Puducherry as I see it today. 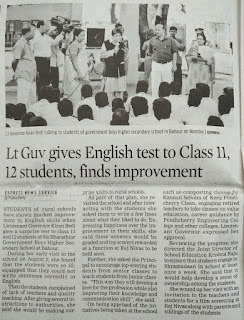 “Based on my school visits, while the GOI plans will have a gestation period, current students of class 10, 11 and 12 in Puducherry need a RESCUE plan. Which means most of the students of rural Government and private schools may need to be assessed on their aspirational needs. We need to link them with a vocational skill immediately after their class exams are over. 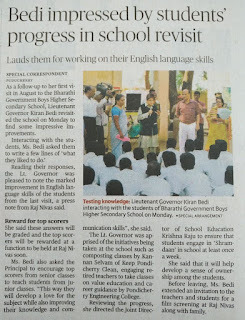 Their respective school principals can be asked to find out from the boys and girls the trade they will like to learn. Then a plan can be drawn to link them with nearby training facility. Of a polytechnic school or an industry to learn as interns or apprentices. After the March exams our Schools could serve as Polytechnics for our Youth. Teachers could be oriented for it. Also we must do a survey to know what happened to last year’s batch. How many went into higher education and how many got self employed, or how many are still unemployed? And what are their preferred trades they will like to learn to be self employed. We could also link them with MUDRA scheme for entrepreneurs bank loans. I have already briefed Honble Minister for Education, Mr Kamlakanan and requested Secretary Education, Mr Anabarsu to make a RESCUE PLAN. The Secretary education has already been assured by GOI for need based Support in Skills Development. For our this year’s passing our students. We have to ensure our youth becomes employable. And thereafter too. Which is why constant training is important to match people's needs. And govt officials to be ahead of the curve. Ask each employee to declare what is that one thing they will do better. This way we will add 30 Thousand new skills and 30 Thousand improved responses. This does not exclude Departmental training programs which u must organise alongside. Let us do it this year. And make it a annual habit. All departments. All units big or small. Let the Secretaries and HODs lead this. I propose to visit your respective departments during the month of Jan. As already shared in the annual wrap up meeting. I shall ask this question from all I will meet. Let the annual evaluation be based on the fulfilment of that commitment as well. Kindly read and communicate this message to all ranks..Every one matters. I repeat I WILL check if employees were informed of this suggestion. Will do a feedback how many knew. Will declare Dept wise after the visits, the quality and extent to which this message was communicated by you all. How many really understood the purpose and how did think this through.